Building a strong and unique brand is invaluable. Consumers are constantly looking for a business that sets themselves apart from others, which is where we come in. At Stark/Raving Branding + Digital Marketing, we identify the unique messaging or compelling story for a business and market it to the target consumers. 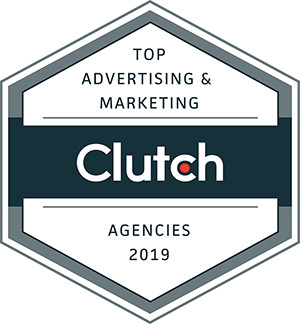 The number of branding agencies is only growing, which is why we're proud to have recently been singled out for our experience and expertise by Clutch. Every month, Clutch recognizes the top performing companies on the platform across various locations and research segments. In their second report for 2019, they selected the companies in Boston that have clearly gone the distance for their clients. The full list of leaders was published by Clutch on March 27, and we’re excited to be featured as a leader among such reputable companies. Clutch is an independent platform that collects feedback from a company’s past and present clients. Clutch analysts perform in-depth interviews with clients about the quality of the services that were delivered to them, along with other information, such as cost and project management. Based on this qualitative and quantitative criteria, Clutch generates a ranking for each firm. Clutch categorizes companies by their geographic location, a field of their expertise and the focus on proven skills to create their annual reports. We perform highly across many of our focus areas, but particularly proud that we are listed as one of the top graphic designers in Boston. We couldn’t have achieved such heights without the contribution of our clients, and their praiseworthy comments. In addition to our presence on Clutch, we also appear on their sister-site, The Manifest. This platform provides information about statistical report analysis to business news articles. We were mentioned on The Manifest among the top brand consultants in Boston, alongside one of our notable projects and list of clientele. We hope our listing on multiple directories helps businesses, who recognize the importance of branding to their business, to connect with us more easily. “We have always believed strongly in taking a client-first approach to the branding process." said Matthew Stumm, Founder of Stark / Raving. "We approach each client with an open mind. We listen. We ask questions. We build relationships. The fact that this award is based on positive feedback from our clients reinforces that creating strong connections with our clients truly matters to our business." We put our clients first, and happy to have found a platform, such as Clutch, which also upholds this value. We’re looking forward to collecting more client reviews, and coming up with innovative brand ideas alongside new and existing clients!